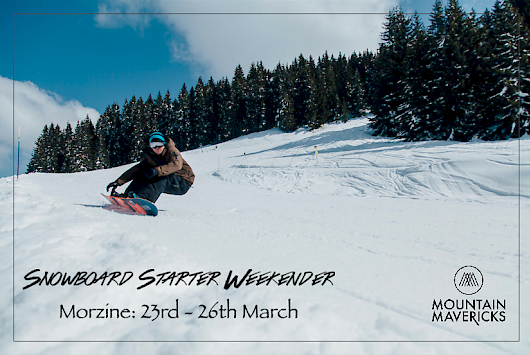 What is Mountain Mavericks Snowboard Starter Weekend? We’re passionate about snowboarding, that’s why we live in the mountains and do what we do. Nothing is more rewarding than seeing other people find their passion for the best sport in the world whilst progressing into a rider who can take on any terrain in any conditions. For that reason we’ve created a package to get people into snowboarding, whilst learning from the best teachers in the Portes du Soleil at a great deal! You’ll also meet other like-minded future snowboarders in a great central hotel in Morzine. Become a confident snowboarder for just €735 per person. > Get in touch for more information. Onyx Snowboarding will do lessons in groups of 4 or more. If there aren’t 4 or more people booked onto Mountain Mavericks Snowboard Starter Weekend three weeks prior to the Thursday 23rd March, then we will amend the weekend to private or group prices. The difference will be paid by the holiday-goer with a range of teaching options available. Previous: Meet Chalet L’Atelier’s Returning Staff!